I read this article and found it very interesting, thought it might be something for you. The article is called April 2015 – Monthly Income Report and is located at http://www.onehourprofessor.com/april-2015-monthly-income-report/. 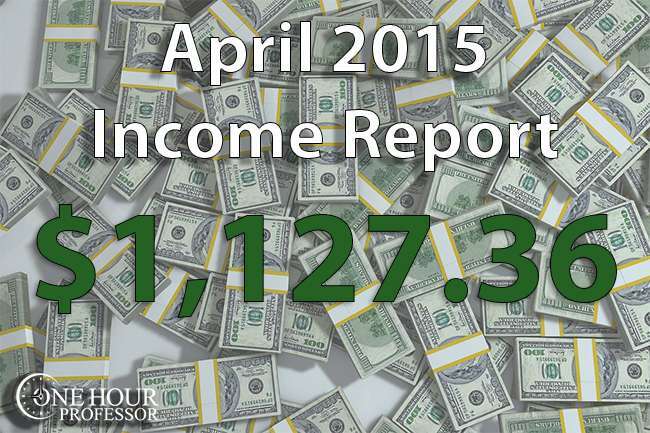 Hello all and thank you for checking out my April 2015 income report. This month was even better than my last and I am happy to report that this was the best month for my website income yet. If you want to always see these income reports when they come out (and get some other cool stuff) make sure to sign-up for my email list. Although I worked a total of 27 hours in April, you’ll notice that I only had two blog posts created and the majority of the time was focused on finishing up my new Udemy course. If you don’t know already, my new Udemy course is focused on helping Udemy instructors use Google Analytics to increase their Udemy course sales. I know that the course is going to be excellent for all Udemy instructors, but as I outlined in a recent blog post, this wasn’t something that the OHP community was asking for and was a misstep on my part. This month I was able to post two blog posts while spending the majority of my time working on my new Udemy course. The first blog post I did was my March 2015 Income report which took a total of four hours to complete. As I mentioned in that income report, March was the best month that my website had in terms of income since it was created. This was a very nice development as I have put so many hours into this blog and am glad to see I’m finally making a profit. The second blog post that I completed was talking about how I screwed up. Mainly this emphasizes how I have been focusing on the wrong things with my online business and need to get back to blogging on the OHP website and creating content that my audience here appreciates. It’s hard to explain this in a paragraph, so I recommend that you read the blog post to understand exactly what I mean. In addition to the blog posts, I put in quite a few hours for my new online course but this is because I’m focusing on a launch sequence to make sure that once the course launches I have people who will immediately purchase it at an early bird discount. I’m spending so much time on this because Udemy likes to see courses that launch and have a lot of sales right in the beginning. If I’m able to get more sales in the beginning, it will likely increase the ranking of my course organically which should lead to more sales in the future. I’ve been on a run the last two months and luckily this month I was able to surpass my earnings from the previous month. Again, the purpose of my website isn’t strictly focused on making money, but I want people to realize that it is possible if you put in the hard work up front. Aside from my consulting, I had a few new revenue sources open up this month that I’m hoping continue to contribute moving forward. First was Themeforest which provided me with $12 this month. Sure, $12 isn’t a ton of money, but all that I did was tell someone the exact theme that I use for the OneHourProfessor.com website (which is named “Marine” by the way and can be found on Themeforest) and they ended up purchasing it. A lot of people enjoy the theme for my website because it’s responsive and has some pretty cool functionality, but I was just happy to see that someone followed through on a purchase. Next, which is a common contributor was Shutterstock. I’ve mentioned this service many times, but if you are looking for high quality images for your website that you can use on your homepage and other areas that people visit frequently, I highly recommend purchasing from them as they have some of the best prices I’ve seen. Another newcomer to the income report is Ninja Outreach. One of the biggest things that bloggers can do right now to improve the visibility of their brand is to post on other blogs and websites. By doing so, you will be able to share your expertise with new audiences and increase the amount of fans that you have. This software is amazing at helping people do that and I even did a review of it to show you what my initial thoughts were. They have a 14 day free trial, so if you’re on the fence about trying it I highly recommend that you do so now as this trial could go way it any day. I personally know one of the founders at Ninja Outreach (What’s up, Dave?!) and he continues to grow the software substantially over time. LegalMatch continues to contribute a few bucks each month for those people who are in need of a lawyer after getting threatened by Getty images. My YouTube Channel didn’t give me as much income as last month, but I’ll take the additional money as I did nothing to earn it but create the videos once. Lastly, I made a few extra bucks from Aweber because someone out there continues to use them as an email provider. While doing my consulting I realize that AWeber really is a great solution for companies that are just starting up. There are definitely more powerful platforms out there, but AWeber is reasonably priced and get the job done. My expenses for this month were less than last month, but I spent around $100 to advertise my new Udemy course focused on explaining to Udemy instructors how to use analytics to increase Udemy sales. In doing this, I didn’t have a ton of email sign-ups like I was hoping and realistically the advertising wasn’t going to give a decent ROI so I stopped. Aside from that, I had the usual fixed expenses of Aweber, Hostgator, and Hootsuite which I now consider something that will continue to recur every single month until my website goes away or I change providers. For the second month in a row I have SEMRush and I intend to use it to better understand my competitors in this market. It’s not cheap at $69.95/month but there are some unbelievable tutorials out there that show you how you can find great opportunities for your content by using the tool. I intend on creating my own tutorial soon, but for now just know that I’ve been willing to spend $140 on it and I don’t usually invest in software or products unless I feel like there will be a good return on investment. The last expense that I had for this month was the usual Elance fees from the various activities that either. In this particular month I use my virtual assistant to complete some Monday and reporting tasks for me and although this looks like an expense, it could be deducted directly from my consulting fees. I made this green because I definitely took a lot of time to set up my funnel for my new Udemy course, but I didn’t get as large of an amount of email sign-ups as I was hoping. With that being said, I definitely did the work that was required so I’m going to consider this goal completed. I made a conscious effort to not create a new Udemy course focused on the Udemy course watch. I did this because I realize that my lunch wasn’t going according to plan and I don’t think it makes sense to create a course telling people how to do something when you don’t have outstanding results or ideas yourself. I feel like this one is self-explanatory. Although I didn’t increase my profit month over month substantially, I definitely did meet this goal. 1) Survey my readers to find out what course THEY want me to make an decide on something. In my blog post this month where I discussed screwing up, I emphasized how I got away from focusing on my own audience and decided to create a course that I thought was needed. This month I’m going to take a completely different approach and survey my readers to understand exactly what it is that they would like to see for a course. 2) Use mind-mapping to figure out what my new course will be and begin the initial build out. After I have the new course decided on, I’m going to use mind mapping to create the basic outline and structure of the course. This will give me a lot of direction for what I need to do in the future. I’m also going to try to begin to work on the course, but I don’t want to jump the gun yet as I’m not sure when I will get around to doing this. I know, I sound like a broken record….but I figure if I keep setting this goal and achieving it, I’m going to be making over $5000 a month in no time. Share your goals for May below, I’d love to hear them! Great news, Ron. So happy for you. You deserve it! Thank you for commenting again, Alejandro! Glad you are still following the blog and I appreciate the kind words. Good stuff Ron, now that you have made all your essential purchases, and got over the start up costs, you can start making a profit. Thanks so much, Richard! It isn’t as passive as I want it to be…yet….but I have some tricks up my sleeve that should contribute. I knew this trajectory was going to happen though. Just like any business, you need to invest up-front to make things happen. I look forward to seeing you turn this thing into mostly passive income. I commented some months back and started following your updates. Congratulations on getting to this point! $5k is next! Thank you so much, Dennis! As of now I only have two consultant clients that I am counting in these income reports because they became clients as a direct result of finding me from this website. Oh man, you are truly rising in the ranks. I am yet to listen to your 1DBB with Pat and Chris. I was about to shoot you an e-mail to say hi but this warrants more than a hi ! Congrats on your income , man. It’s inspiring. I’ll let you know what I think of the show and lessons I personally will be using and applying to my blog. Oh, I did finish up the PhD in March. I a legit Dr. Haha. Did you move to AZ already ? Sorry if you have mentioned it in a post somewhere. I have been out of the loop.